Today I had a busload of Norwegian visitors in the studio. They were actually visiting the area to look at castles, but improvised a morning visit at Villa Holsby. They were very inspired and interested. I also managed to work a little on the portrait. Azo Yellow Lemon and Cobalt Blue. What shall I do next? Hmm…. Yesterday Andrea and I attended the opening at Höganäs Museum with silicone works by Mattias van Arkel and abstract paintings by Richard Ahlqvist – a very nice exhibition. We also went to Skärets Konsthall, for the opening of an exhibition with Britta Marakatt-Labba, a Sami artist who works with embroidered pictures from the Sami mythology and culture. Very interesting! I have been busy in the studio, but mainly cleaning up and re-arranging stuff. I have bought some equipment and inventory from a man who has been doing a lot of framing, so now I almost have all that is needed to do professional framing. Nice. Finally I am back in the studio. 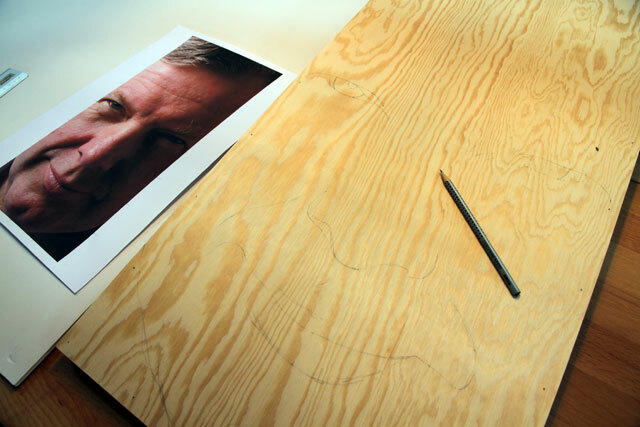 A very subtle beginning – a thin outline of the most important features. A quick layer with golden ochre, diluted with a lot of linseed oil. From now on I am trying to save the main lines. The paint soaks in to the wood rather quickly and I can soon continue with another layer, this time green umber. These three steps within about three hours. Tomorrow I will continue, but I don’t know how. 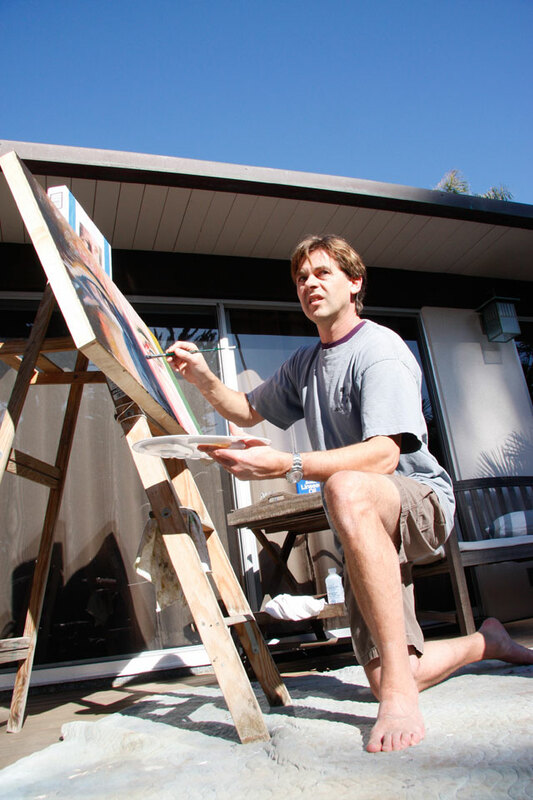 Not much happening in the studio right now, so let me share some pictures of a painting I did in San Clemente, Southern California, during our vacation at Christmas/New Year. I had not brought any material, so we had to get everything I needed (brushes, paint, plywood, etc) and then I had to be creative in order to arrange a “studio”. 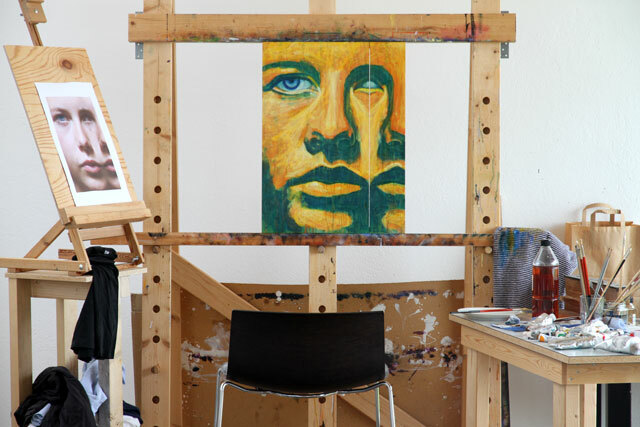 An old wooden stepladder was made into an easel. I took a picture of our host, standing on the beach in the afternoon light, gazing at the ocean. I cropped the picture and made a painting size 2 x 4 ft. When the painting was done, I applied a thick coat of resin (which Wayne bought from a surf shop) on the entire surface. For some reason the resin seemed to react to the linseed oil and it created a very un-even surface, which made a cool effect. I called the painting Watching for the Wave, as Wayne is an avid surfer. We stayed for two weeks with Wayne and had a fantastic time. 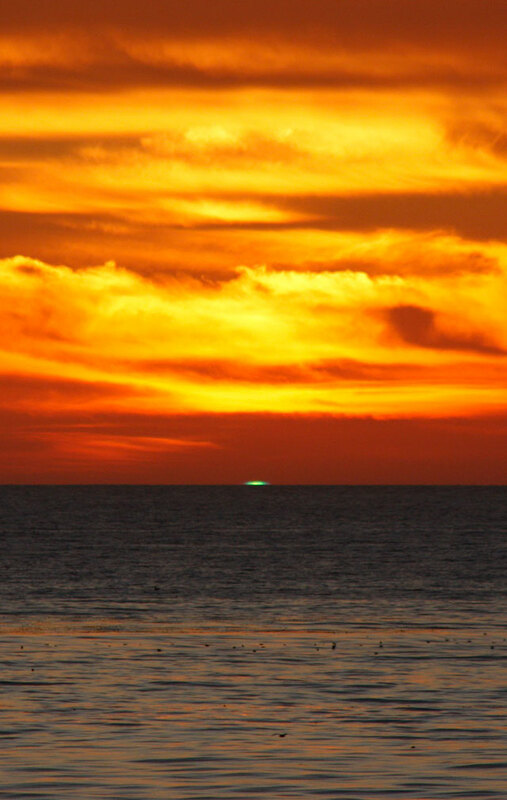 One evening, as I was taking photos of the breathtaking sunset, I was able to catch the famous Green Flash! I had heard of it for more than 25 years, but never been able to see it. It was truly a flash – it was gone in a second. The photo is totally un-edited – it is exactly as the camera caught the sky and the sun! 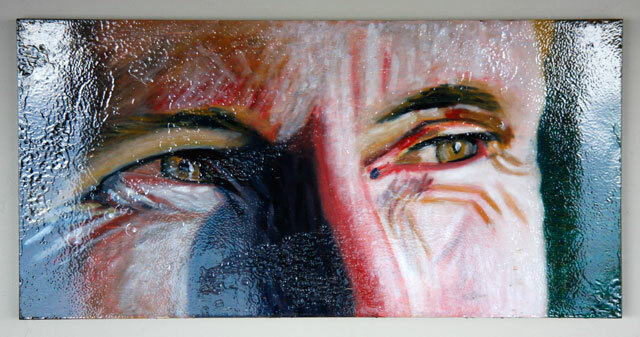 Today I have presented my first commissioned portraits to the very pleased clients. 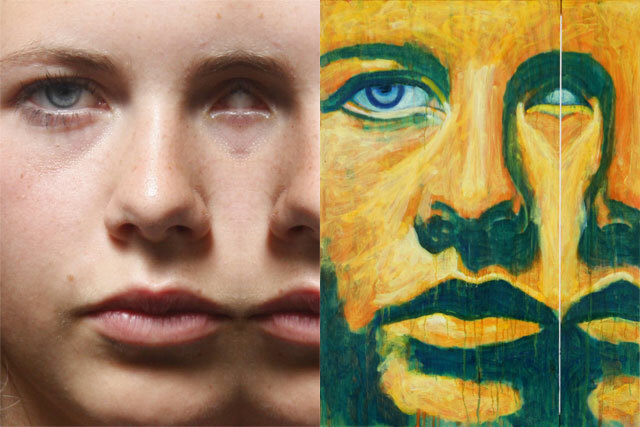 I have painted two sisters and one brother on three separate plywood boards, 40×30 cm. Afterwards I made cutouts and sprayed the dark parts on the back of three separate glass pieces. I sprayed bronze and black in very thin layers to enable the oil painting on the wood to still be visible. I mounted all three parts to make it into a triptych and then I manufactured a wooden frame and spraypainted it black on the front/inside and yellow/bronze on the outside. 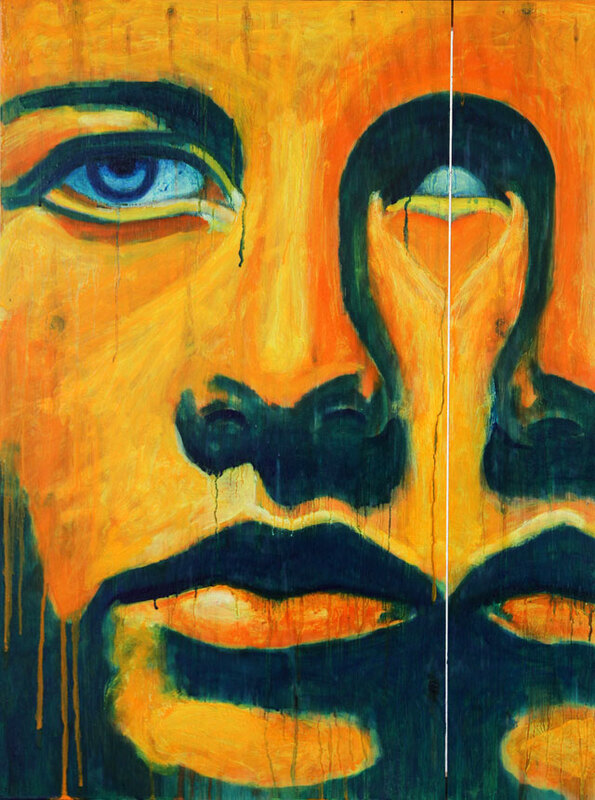 The total size of the work is 40×90 cm and I call it “Inseparable” because the triptych cannot be taken apart and sisters and brothers are always sisters and brothers no matter what life brings. Currently I have to alter my work between the studio and the bathroom at home. Sounds strange? 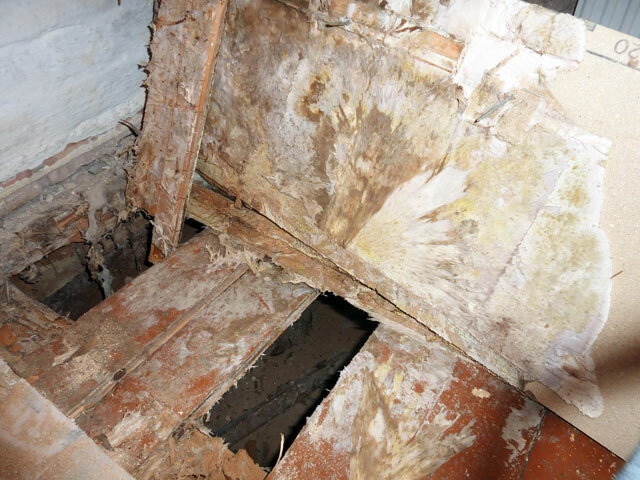 Well, a few months ago we made a not so nice discovery – we found out that we had fungus in our 100 year old house. Some years ago we came home from a trip and found water running down the inside wall in one section of the house. It had rained heavily and it turned out I had forgotten to empty the gutter from old decayed leaves… Now we have had to tear out the entire bathroom, take out all the “infected” beams, floorboards, etc. As you can imagine, our house is rather dusty. Under the floorboards there is a 10 cm layer of soil (very dry and dusty) which they used as sound and fire insulation when they built the house. But now we have treated the fungus damage and have made several essential changes so that the fungus will not have a chance to come back in this part of the house. Lucas is helping me and now we are finally building up the new bathroom again. 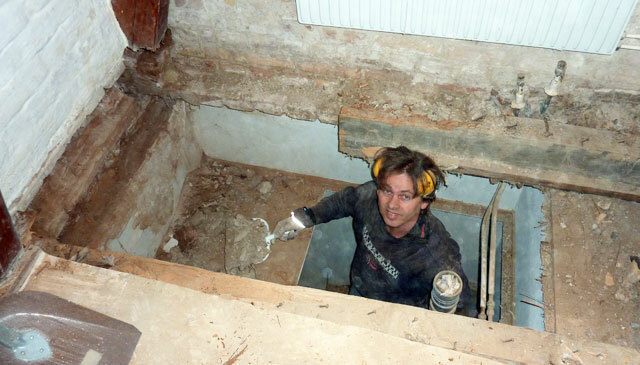 A funny picture Lucas took of himself after working some hours, removing old tiles, mortar, dry soil, etc. He is going to do the main job and I have to force myself to stay in the background and let him do most of the work. It is fun work and it is great to work with Lucas. We have also had some great help from carpenters Mattias and Filip, and plumber Peter. 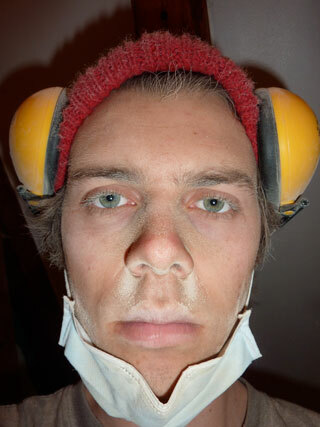 As you can see in this picture of me – dusty, dusty, dusty. After letting the work rest and dry since Saturday, I have today only added a thin and diluted layer of Zink white (diluted with linseed oil only). Zink white is great because it lets me add almost transparent layers of white. 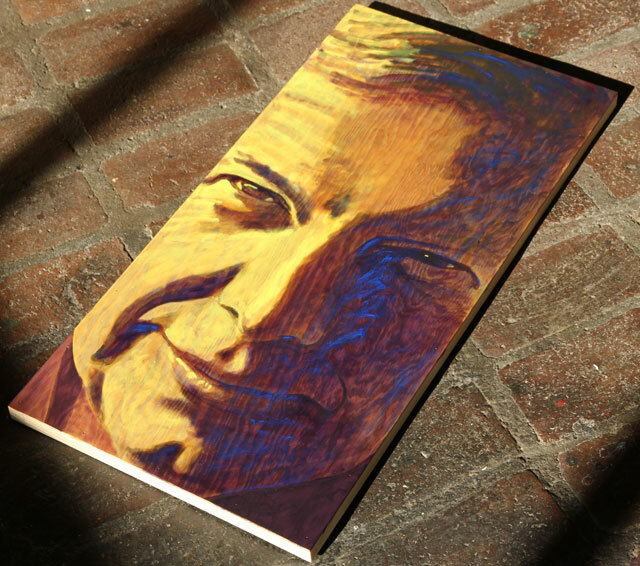 Now the painting has a quality which is hard to convey in a photo, as there are areas of glossyness where the plywood has not been able to absorb all linseed oil – and other areas where the oil has soaked in, leaving a matte surface. The size of the work is 64 x 48 cm and I think I will name it Forgetting your mirror image. I will paint the sides and then let it rest. I don’t know if I am done… it does not feel like I am, but I will not force the process. I will paint the sides in Monastral Blue (also Phthalocyanine Blue BN), a blue color I have hardly used. It is cool blue with a slight green touch to it. You can find some interesting information about this color on Wikipedia. Today I buy my oil paints from Ottossons Färgmakeri, a small Swedish company founded by Gunnar Ottosson 25 years ago. 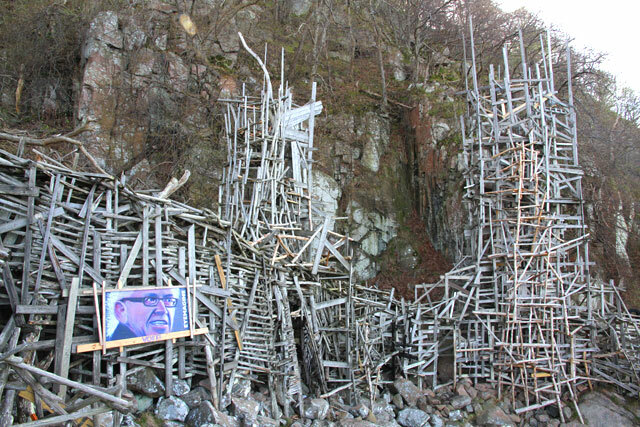 I visited his shop and factory in Genarp outside Lund a few months ago. Gunnar guided us on a tour around his amazingly clean factory. He has had to learn to manufacture linseed oil paints pretty much from scratch, by trial and error. Most of his products are used for painting of wooden houses, etc. Only a small portion of his sales is artistic colors. It is fascinating to learn about his story (www.ottossonfarg.com) and his product is great! The linseed oil I use is Cold Pressed and boiled. Right now I am testing the linseed oil which Ottossons are using and selling under their own name. It is a very transparent oil. I am not totally fond of the smell, but it works great. Normally I have been using the linseed oil sold by Claessons Trätjära (www.claessons.com). This oil is not quite as transparent, it is somewhat lighter and more yellow in its color, it smells good and is really nice to work with. The mainstream linseed oils which you normally by in any paints store are not as nice to work with, not for me anyways – they make me feel “funny” as if they would contain some dilutant (mineral spirits or something else). One great thing with linseed oil is that I only need soap (grönsåpa, kristalsåpa, linoljesåpa, etc.) and water to clean my brushes. OK, now I have started up a real blog, using wordpress.com. It is going to be easier to maintain and also possible to leave comments. This morning when I arrived at Villa Holsby I noticed the recent landscape painting (my first) I did of a steep mountain in Engelberg, Switzerland. I call this painting North Face half covered (since I have decided to only paint faces and people). Yesterday I re-arranged some paintings and hung this one so that the light from outside would reflect itself in the glass that only covers part of the painting. 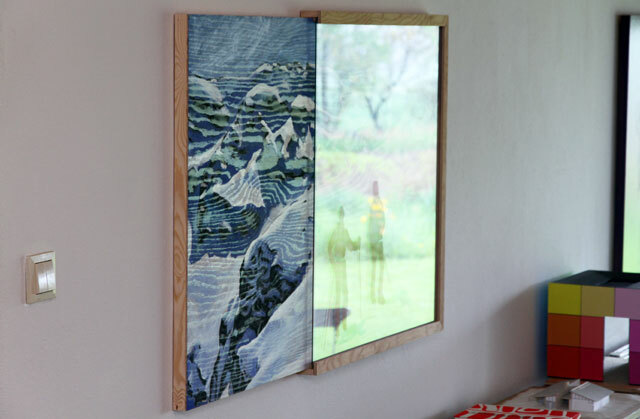 The size of the painting is 80 x 140 cm (oil on plywood) and the glass is 80 x 80 cm. 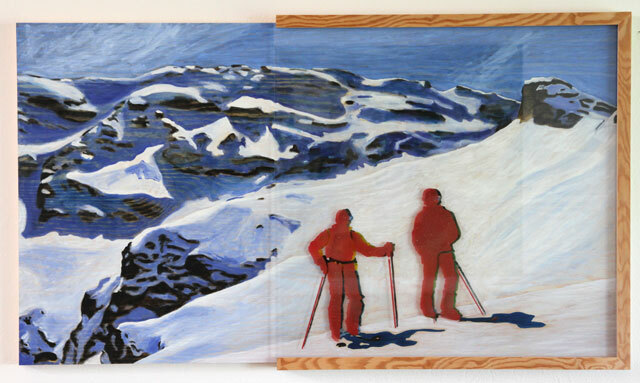 The two skiers, Thomas and Lucas, are painted in colors on the plywood and their silhouettes are also spraypainted in bronze and red on the back side of the glass. 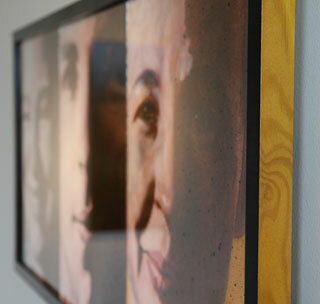 When I arrived I was intrigued by how the grain of the plywood makes an interesting pattern in the painting. Work in progress… and I am just watching it happen.